Abramtsevo-Kudrino Wood Carving is a famous Russian handicraft that took shape in the vicinity of Abramtsevo Estate situated near Moscow. The appearance of the handicraft was closely associated with artists of the Abramtsevo circle, and first of all with Elena Dmitrievna Polenova, who organized a carving and woodwork workshop in the estate of Savva Mamontov. Peasants from the nearby villages of Khotkovo, Akhtyrka, Kudrino, and Mutovka learned woodcarving and worked there. Special attention in the workshop was paid to educational process and encouraging creative spirit among the students. Apart from woodcarving skills they were taught drawing and basics of painting. The classes were given in the Abramtsevo Museum: an enormous collection of folk art items had been collected in the estate. The graduates of the workshop were presented with instruments to start their own business. In 1890 one of the graduates, V.P. Vornoskov, founded his own manufacture in his native village Kudrino and started woodcarving to orders of the Abramtsevo workshop. Initially small, this workshop originated the future trademark of carving. A peculiar style of ornamental carving was developed in Kudrino workshop: the craftsmen found apt combinations of flat relief and geometrical carving, as well as harmonious utilization of carving décor in household necessities. In the first years of work the shaping of the original style was greatly influenced by professional artists V.I. Sokolov and S.V. Malyutin. Covered with rhythmical floral ornaments, Kudrino workshop’s items – ladles, caskets, kegs, saltcellars, decorative plates and vases – were notable for diversity of tinting that highlighted the natural beauty of wood. The floral ornament is based not only on samples of carved peasants’ articles and house décor, but also on ornamental headpieces of books published in Russia before the 18th century. The development of ornaments by Kudrino carvers was going from combinations of separate elements, such as twigs, scrolls, and rosettes, to overall ornamental compositions covering the entire article. The year 1922 saw the foundation of the artel “Revival” that started developing fast, and in the mid 1930s it already included more than 120 craftsmen. The works made in the artel enjoyed popularity and were repeatedly awarded with diplomas at Russian and international exhibitions. In 1936 the artel implemented a unique order: decoration of one of the entrances to the exhibition of folk art in the Tretyakov Gallery. It was the only work by Kudrino masters in the sphere of monumental art. For the International Exhibition in Paris in 1937 Kudrino carvers prepared an extensive collection, with replicas of lots of the early works by V.P. Vornoskov. 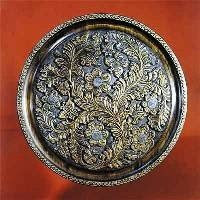 In the following years the carving handicraft was developed by craftsmen and artists of different generations. Presently the centre of Abramtsevo-Kudrino Wood Carving is located in the Khotkov town of the Sergiev-Posad Region, where a factory of carved artware is operating. 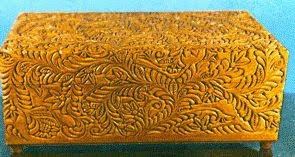 Specialists of Abramtsevo-Kudrino Wood Carving are trained at V.M. Vasnetsov Arts and Crafts College in Abramtsevo.